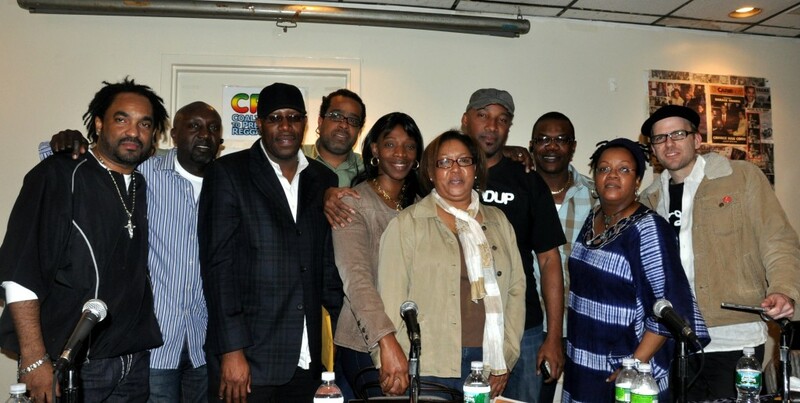 Left to right: Ed Robinson, Mikey Sterling, DJ Roy, Spreadlove Bobby, Avril Francis, Francine Chin, Dahved Levy, Richie Poo, Sharon Gordon and Carter Van Pelt. The high energy exchange between the panelists, commentators and the community who attended was moderated by Sharon Gordon, chairperson and co-founder of CPR. The official commentators for the evening, radio host, Jeff Barnes, singer/drummer/producer Ed Robinson, radio host, Francine Chin, and the well known DJ Prentice all offered unique perspectives on the issue. Many on the panel thanked CPR for the opportunity to hear how the people in the community feel and think, while many in the audience expressed gratitude to CPR for giving them a place for their voice to be heard. With many on the panel being on brokered radio, a good portion of the evening was spent discussing the challenges of brokered radio on which the community relies heavily to hear music and obtain information. The exorbitant costs of maintaining brokered air time was passionately discussed. About CPR: The Coalition to Preserve Reggae Music (CPR) is a charitable organization working to raise the bar in the creation, development, promotion and presentation of reggae music. CPR conducts educational forums and presents music events to raise funds to research, codify, curate and disseminate literature regarding the music. About POBH: People of Black Heritage (POBH) is a 501(c) (3) Not-for-Profit Organization formed in 2007 with the exclusive intent of serving as a charitable and educational organization. Its mission is to provide community based support services that will empower and enhance the quality of life of underrepresented inner-city residents. – Emergency Ponchos – These provide warmth and shelter for your family. too far from those modern conveniences. In this modern age of hybrid technology everything is more simplified for those who are born which has a natural sense of music. instruction videos to assist you. A cruise is a pleasurable experience for your family members of any age. sociable recreation with family and buddies. The admiral running the war games stacks the odds in his own favor by hand-selecting an crew of misfits. It’s amazing designed for me to have a web site, which is valuable for my experience. a finest web site for hottest updates. from bding stolen? I’d genuinely appreciate it. it out of there since it is unable to absorb the nutrients which it no longer understands. It has up to 99 minute long grilling time for preparation of a variety food items. Wow, this post is fastidious, my younger sister is analyzing these things, thus I am going to let know her. I’m hoping to provide something again and aid others such as you aided me. Ho usato per essere consigliato questo sito attraverso il mio cugino .
. Tu sei incredibile! Grazie ! get your internet site on the number one position in the search engine. имея лишь доступ в интернет и немного свободного времени.